ohn Hagee is the founder and senior pastor of Cornerstone Church in San Antonio, Texa--a non-denominational mega-church with more than 20,000 active members. It is said that Hagee speaks worldwide into 99 million homes. He forged an unprecedented alliance between Israel-loving Christians and Zionist Jews. His organization, "Christians United for Israel," lobbies for the Jewish state and opposes any land concessions for peace. Hagee has boasted that his powerful organization has more influence than the famous Jewish lobbying group AIPAC. "When a congressman sees someone from AIPAC coming through the door, he knows he represents six million people. We represent 40 million people," the televangelist said. So set aside theological agendas except one mandating Christians to silence. This should cause alarm among Christians. Silencing the Gospel is the act of persecutors, not Christians. Because of the power and effects of Christian Zionism, Hagee's teachings should matter to everyone. But they should especially matter to Christians. Mark Biltz looked at NASA's tables for solar and lunar eclipses and found that we have had blood-red moons on the first day of Passover and the first day of Sukkot on back-to-back years seven times since A.D.1. Biltz also found a string of lunar and solar eclipses starting in 2014 through 2015 and nothing significant for the rest of the century. In 2015 there will be a pair of solar and lunar eclipses two weeks apart (on the new moon and full moon) one in the spring and one in the fall. From that he postulated that perhaps Yeshua will return that year, around the time of the final eclipses in the fall. His intriguing discovery caught the attention of prophecy buffs everywhere. In April, he did a video interview with Prophecy InTheNews.com. In that video R. C. Church said that what Bilts is teaching is "A discovery of astronomical proportions." Later that month World Net Daily.com did an article summarizing the interview, which was titled "Blood Moon Eclipses: 2nd Coming in 2015?" Well Hagee picked up on this and really popularized it with his video's and books. Hagee starts his series on "The Coming Four Blood Moons" by reading Joel 2:30-31 and Acts 2:19-20 and says that these four blood moons that run from April 15, 2014 to September 28, 2015 are what Joel and Peter were talking about. He says, "They will be a world shaking event." Then he asks, "Is this the end of the age?" Hagee says, "The heavens are God's billboard, and when something big is about to happen He gives planet earth a signal that something significant is about to happen. Pay attention! NASA said these four blood moons are coming. God has said through Joel and St. Peter, Listen!" So should we be watching the sky, or reading our Bibles? What Hagee misses here is that they weren't just for signs but also for seasons. The word "sign" is from the Hebrew wordoth, which means "the sign" or "the seal." Examining the Hebrew letters of the word oth we get alef, meaning: "leader," vavmeaning: "nail," and tav meaning: "cross." The sun, moon, and stars were first and for- most a "sign" of "the Leader nail[ed] [to the] cross." How do the heavenly lights point to Messiah? Hang on. The word "season" is the Hebrew mow'ed, which means: "appointed times," referring to the Feasts of Yahweh. The Feasts point to Messiah, and they are dependant upon the moon and sun. So the sun, moon, and stars are placed where they are for the Scriptural determination of the Feasts of Yahweh, which point to Messiah, "the Leader nailed to the cross." All these feasts were fulfilled in AD 70 with the destruction of Jerusalem. The moon is no longer a sign. The signs have been fulfilled. Hagee says, "These verses describe a time in the future when the sun and moon will eclipse at the same time." He says these coming blood moons are God's signs to this terminal generation that something big is going to happen soon. He connects these four blood moons with Israel as Blitz did. Saying that every time these four blood moons appear it is a sign of something big happening for Israel. Hagee says that these four blood moons have happened three other times to mark significant events in Israel's history. They happened in 1492, which was the Spanish Inquisition final year, when the Alhambra Decree ordered all remaining Jews who would not convert to Christianity to leave Spain. Hagee says that each time, God lit up the heavens by four blood moons. He makes it sound like these are the only times the four blood moons happened, but that isn't quite true. Mark Biltz found that we have had blood-red moons on the first day of Passover and the first day of Sukkot on back-to-back years seven times since A.D.1. Only three of these occurrences were connected to Israel. The others were in A.D. 162/163, A.D.795/796, A.D.842/843, and A.D.860/861. We don't have any historical connections to Israel for these years. Hagee says, "The worlds greatest scientists at NASA have confirmed that the four blood moons have happened three times in five thousand plus years. And it's getting ready to happen again starting in April 15, 2014." Hagee says, "Jesus said when you see these signs (which to Hagee means "The Four Blood Moons") lift up your heads because your redemption draws near." Quoting Luke 21:28. Then he says, "The Church is soon to leave this world." And then to a thunderous applause he says, "The King is coming, the King is coming, He is coming soon." Hagee says over and over that, "Jesus said, 'When you see these signs (pointing to his chart of "The Four Blood Moons") lift up your head for your redemption draws neigh.'" All the church is applauding. The "these things" in the context of this verse is the destruction of Jerusalem. Hagee keeps using this verse, telling his people that when they see "The Coming Four Blood Moons" their redemption is drawing near. He is two thousand years late. On the very day that the Jews from around the world gathered in Jerusalem to reaffirm their commitment to the Covenant of Moses, the Holy Spirit descended upon Israel to offer the promise of the New Covenant to all who will believe. This New Covenant makes Torah a matter of the heart. The Hebrew people had gathered for the Festival of Shavuot as they did every year for a thousand years. But this time it wasn't a rehearsal, it was the antitype. The prophecy that they came to rehearse was being fulfilled. This day they were to become the "first fruits"; members of a new Church, the Church of Yeshua the Messiah. The promised New Covenant had arrived. 'In fact, trying to convert Jews is a "waste of time," he said. 'The Jewish person who has his roots in Judaism is not going to convert to Christianity. There is no form of Christian evangelism that has failed so miserably as evangelizing the Jewish people. They (already) have a faith structure. Everyone else, whether Buddhist or Baha'i, needs to believe in Jesus,' he says. 'But not Jews. Jews already have a covenant with God that has never been replaced by Christianity,' he says. He teaches a separate covenant for Israel and Christians. So what in the world is happening to these Jews at Pentecost? Please notice that the very first act of this newly constituted Christian congregation was to do an expositional study of the Scriptures. In the midst of this great outpouring of the Holy Spirit, among signs and wonders and speaking in tongues, what did Peter do? Essentially, he said, "Let's have a Bible study! Let's study Joel to gain an understanding of what is happening." Paul calls the Church: "the pillar and support of the truth." The word "pillar" here is the idea of "display." The idea is that the Church's mission is to hold up the truth of God for all men to see. The Church is to support and display the truth of God. We are not the source of truth, the Bible is, but we are to support and display it. The Bible is God's Word, and the Church is to support and display that truth. I don't believe that the Church's mission has changed; we are to be the pillar and support of the truth. This is done through faithfully expounding the truth of God's Word. This is the mission of every local church, but I believe that most local churches have forsaken this role. In his book Amusing Ourselves to Death, Neil Postman writes, "Toward the end of the nineteenth century. . . the Age of Exposition began to pass, and the early signs of its replacement could be discerned. Its replacement was to be the Age of Show Business." Notice carefully what Peter says here. "This"--referring to the outpouring of the Holy Spirit, the birth of the Church, the arrival of the New Covenant, the beginning of the second exodus for the New Israel. Peter says that what you are seeing happen here is "...what was spoken of through the prophet Joel." Peter is saying, "This is what Yahweh told us would happen through Joel." Now Hagee takes Joel 2 and Acts 2 and ties them to "The Coming Four Blood Moons." But what Peter is very clearly saying is that what is happening in Acts 2, what they were experiencing was the fulfillment of Joel 2. The first century church was experiencing the fulfillment of Joel's prophecy. "This is what was spoken of through the prophet Joel." This is the most remarkable event in the history of Israel, and there are no blood moons here. Peter proceeds to quote, with a few minor variations, Joel 2:28-32. Later Peter will cite Psalm 16:8-11 and Psalm 110:1. He did not have a Bible in book form, since books, as we know them, were not yet invented. And he did not unroll several scrolls to the right text so that he could read these verses. Rather, he recited them from memory! The Jews placed a huge emphasis on memorization of God's Word. We should all be hiding God's Word in our hearts. Joel 2.28 reads, "And it shall come about after this that I will pour out my Spirit on all mankind." But Peter, under the inspiration of the Spirit, changes it to "the last days." So Peter is saying that he and his audience were in the "last days." What exactly are the "last days"? When did they start? When did they end? These are very important questions that must be answered if we are going to interpret the Bible correctly. Hopefully, this study will answer these questions. Most Christians today would probably say that we (twenty first century American Christians) are living in the last days. This is a commonly held view. There are many today who believe we are in the last days, because they see all of the Middle East turmoil, technological advancements, "new world order," high gas prices, immorality, etc. They claim that these are fulfillments of biblical prophecy that prove that we are in the last days. John MacArthur writes, "Now I'll tell you something very simple. Put it in your theological file, you're living in the last days. Everybody's been living in the last days since Jesus arrived to minister." So he says that the last days have lasted for 2,000 years. At the time that Peter preached this message Israel had been in existence for about 1600 years. If Israel was only 1600 years old, does it make sense that her last days would last for 2,000 years? How could her last days last longer than her whole prior existence? The writer of Hebrews says that they (first century Christians) were in the last days. Most Christians would agree that the last days began around the time of Christ; the big debate comes over when do the last days end? Hopefully, our study today will help us answer that question. The CJB has here "acharit hayamim (ak-crit-hi-mem). Here again the vision is concerning the Jews. It was concerning what would happen to Israel in the last days. The vision was concerning Judah and Jerusalem. This is speaking of the New Covenant that is inaugurated in the "last days." Nowhere is the phrase "last days" used to refer to the physical planet, but, rather, it is referring to the "last days" of the nation Israel. Moses says, "...evil will befall you in the latter days..." Moses was leading the company of Israel. There is no reference to Gentiles being the subject of these latter days. Hagee says that these nations, listed in Ezekiel 38 are Russia, Iran, Lybia, Germany, Turkey and Etheopia. He says, "These nations will come against Israel and God will wipe them out." Hagee describes in detail how this battle of Gog and Magog will take place. He tells what Israel will do and what these nations will do. His says that verse 2 talks about Putin and Russia. He says that the word "lions" in verse 13 in the KJV speaks of America. He goes on and on spouting out Zionistic drivel and his people stand and applaud. The phrase "your people" is referring to Israel. Israel is Daniel's people. The time of this writing is about 536 B.C. He says that the vision of what will happen to Israel in the latter days is a long way off, "...the vision pertains to the days yet future." So, in Daniel's time, the "last days" were a long way off. Within national Israel is "true Israel," or "spiritual Israel." Most of Israel was faithless, only a remnant was redeemed. Those of faith made up the remnant. Hagee says, "The message of the four blood moons is this, God is going to defend Israel in His time." The exact opposite is true! The Scriptures that talk about the moon turning to blood are talking about national Israel's destruction. Booth refers to his family line. Yahweh is going to destroy and rebuild Israel. Israel is not a term like Ammon, Moab, Greece, or Rome. Israel cannot be defined in terms of physical descent, or understood simply on the human side; it is created not by blood or soil, but by the promise of Yahweh. It is evident, or at least it should be, that physical Israel was the main subject involved in these texts dealing with the "last days." Their last days came, and Yahweh destroyed them. The nation of Israel has not existed for nearly 2,000 years. National Israel was destroyed in A.D. 70. Those in the Middle East who affirm themselves as Israel have no right to do so. There is no Jewish race or nation today. Yahweh put an end to Judaism in A.D. 70. The "last days" were the "last days" of Israel. The last days ended when the nation Israel ended. By the "dispensation of grace" I assume he means the New Covenant. And if this is what he means, then he is biblically illiterate. Because the Bible only talks about two ages. And the only age that ends in the Old Covenant is the Jewish age. The last days are the last days of Israel. Yeshua, here, very plainly and very clearly, tells His disciples that ALL of the things He had mentioned would come to pass inTHEIR GENERATION. This includes the Gospel being preached in all the world, the abomination of desolation, the great tribulation, and the coming of the Son of man. 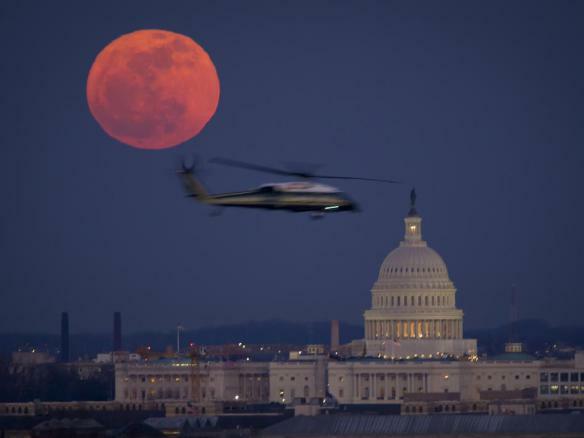 Hagee ties Matthew 24:29 to the coming four blood moons. But again he is off by two thousand years. Yeshua said His generation would see the "...moon not give it's light." And biblically, a generation is forty years. These passages that refer to the dimming of the sun (Matthew 24:29; Joel 2:31) and the moon turning to blood (Joel 2:31) are speaking in apocalyptic terms; this is not literal language. Yeshua said it all happened in His generation. Contrary to popular opinion, we are not living in the "last days," but the first days of the New Covenant age. The New Covenant age is "the eternal covenant." An eternal covenant has no "last days." We are living in the first days of the eternal age. The "last days" spoken of by the biblical writers were the "last days" of the Jewish Old Covenant age, which became obsolete and passed away in the A.D. 70 with the judgment and destruction of Jerusalem. The coming four blood moons will be the eighth time this has happened since 1 AD. They mean nothing as far as the Bible is concerned. The biblical end times are over! Hagee said, "None of these dates are mine, half of them belong to God and the other half to NASA. And they are both to reasonable intelligent sources of reference." He says that these four blood moons are God's predictions and NASA's predictions, He says he is making no predictions. Really? He continually ties the coming four blood moons to verses in Scripture that talk of the Second Coming, but says, he's not making predictions! When these four blood moons come and go, Hagee will change his view and keep right on preaching to his faithful undiscerning crowd. But until then, let's use people's awareness of these coming four blood moons to share the truth of fulfilled eschatology with them. Mark Biltz is the founder of El Shaddai Ministries, a Hebrew roots resource and teaching ministry located near Tacoma, Washington. Recently Biltz has attracted attention in presentations and YouTube videos about end-time prophecy and the Lord’s return. He discusses the significance of four total lunar eclipses that will fall on the dates of Passover and Sukkot in 2014 and 2015. The Crucifixion of Jesus was at the time of Passover, and Biltz believes that the Second Coming of Christ must happen at Sukkot, so he argues that this relatively unusual event of four lunar eclipses on these four dates has great significance. He also mentions two solar eclipses in 2015 having prophetic implications. Because total lunar eclipses often appear red, people sometimes call a totally eclipsed moon a “blood moon.” Therefore, Biltz suggests that these eclipses are a fulfillment of the prophecy in Joel 2:31 of the sun being darkened and the moon turning to blood and suggests that they may presage the Lord’s return. Others, such as John Hagee, have begun speaking about this as well. Let us examine some of these claims. Why do total lunar eclipses often appear red? A lunar eclipse occurs when the earth’s shadow (the umbra) falls on the moon. If the earth’s shadow completely covers the moon, it is a total eclipse. But a partial lunar eclipse happens if the earth’s umbra only partially covers the moon. Because the earth has an atmosphere that bends light around its edge, the earth’s umbra is not completely dark. So, the totally eclipsed moon will reflect the color of the light contained in the earth’s shadow. The earth’s atmosphere scatters out shorter-wavelength light (green through violet) leaving mostly longer-wavelength light (red, orange, and yellow) in the earth’s umbra. This is why sunsets and sunrises generally are red, and why most lunar eclipses are red. How unusual are total lunar eclipses? Total lunar eclipses aren’t that unusual; there will be 85 total lunar eclipses in the twenty-first century. The greatest length of time between two consecutive total lunar eclipses is only three years. In between these “droughts” will be occurrences of three or even four total lunar eclipses, each separated by about six months. A little more than half the earth’s surface can witness at least a portion of a particular eclipse. So, from any given location, total lunar eclipses aren’t quite as common as these statistics might suggest. But what about the coincidence of the four eclipses of 2014–2015 with Passover and Sukkot? This, too, is not quite as remarkable as has been claimed. 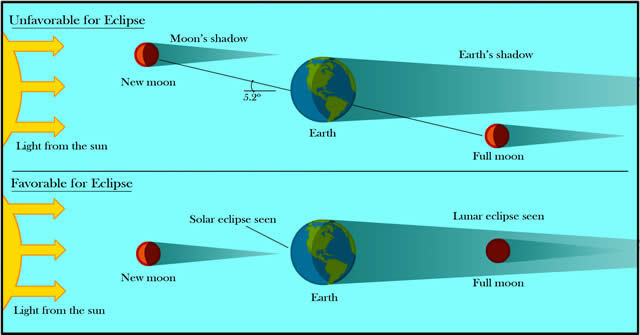 Since a lunar eclipse occurs when the shadow of the earth is cast upon the moon, a lunar eclipse can happen only when the earth is between the sun and the moon. This happens once each month when the moon’s phase is full (fully illuminated as viewed from the earth). But there is not a lunar eclipse at full moon each month, so there must be more to it. There are two times per year when the nodes are roughly aligned with a full moon. These eclipse seasons are little more than a month long, and they are separated by a little less than six months. The moon’s orbit precesses in an 18.6-year period, so the eclipse seasons shift about 20 days earlier each year. The result is that the possibility of lunar eclipses happening around the times of Passover and Sukkot (which are six months apart) repeats roughly half of this 18.6-year period. For instance, in 1995–1996, there were four lunar eclipses (not all were total)—two that fell on Passover and the other two within a day of Sukkot.1 I set up a telescope for public viewing during the total lunar eclipse in September 1996 and mentioned to the people who showed up Joel’s prophecy and the timing of the eclipse with Sukkot. But isn’t it unusual to have a lunar eclipse on the same day as Passover or Sukkot? The civil year began near the autumnal equinox on the first day of the first month, and Jews today still celebrate Rosh Hashanah (New Year) then. However, at Sinai God established that the ceremonial year would begin in the spring, six months earlier. The festivals that the Hebrews were to observe on this ceremonial calendar are recorded in Leviticus 23. Passover is the fifteenth day of the first month and Sukkot begins on the fifteenth day of the seventh month, six months after Passover. Thus, Passover and Sukkot are always at full moon and always six months apart. There are roughly 29.5 days in a lunar month and thus 354 days in 12 lunar months. This contrasts with about 365 days in a solar year, so some adjustments must be made to keep solar and lunar calendars synchronized. The easiest adjustments are to alternate between 29 and 30 days per month and to add an additional, intercalary month about every three years. Eventually the Hebrews adopted the Metonic cycle, a method of adding intercalary months appropriately in a 19-year cycle, but it is doubtful that they adopted this immediately.3 The first of each month initially may have been observationally determined, but eventually, as today, a formula determined when the first of each month occurred, and that algorithm nearly always matches what one would normally observe as the beginning of the month. A lunar eclipse must happen exactly at full moon. On a lunar calendar the fifteenth of the month falls on or within a day of exact full moon, so any lunar eclipse must be on or within a day of the fifteenth of the month. Hence, any lunar eclipse that happens near the equinoxes must fall on or within a day of Passover (spring) or Sukkot (autumn). Therefore the coincidence of these festivals with lunar eclipses is not as rare as Biltz implies. 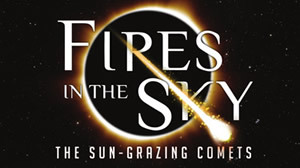 We are excited to announce a new program in ourStargazers Planetarium at the Creation Museum.Fires in the Sky: The Sun Grazing Comets comes just a few months before the sun grazing Comet ISON makes it's pass around the sun later this year. To illustrate the frequency of the coincidence of lunar eclipses with Passover and Sukkot, consider the 230 lunar eclipses of all types (total, partial, and penumbral) during the twentieth century (1901–2000).Table I lists the 37 lunar eclipses in the twentieth century that coincided with Passover or Sukkot (Passover always is in March or April, and Sukkot always is in September or October). Many of the dates of lunar eclipses exactly match the dates of the Passover or Sukkot. Others are off by one day, and a few are off by two days. There are at least five reasons why these eclipses don’t exactly match the dates of the holidays. First, the algorithm for determining the beginning of the Hebrew months results in the first of each month falling one or two days after astronomical new moon. This difference of a day or two causes the fifteenth day of each month to vary by a day or so from astronomical full moon, which is when a lunar eclipse must occur. Second, the moon doesn’t move in its orbit at a uniform rate, so the time between new and full phases varies slightly. Third, the date of each eclipse is listed for the Universal Time (UT, which for our purposes can be treated as the same as Greenwich Mean Time [GMT]) of mid-eclipse. This means that many of the eclipses span two days in UT. Fourth, since lunar eclipses are seen at night and we change our calendar day at midnight, lunar eclipses must span two days as reckoned locally anyway. Fifth, there is a little ambiguity as to the date of Passover and Sukkot. In our modern convention we begin our days at midnight, but in Hebrew reckoning the day begins at sunset. On most calendars the dates of Passover and Sukkot are listed as the conventional date on which the sunset would commence the respective observances. For instance, in 2013 we said the Passover began on the evening of March 25, but in Israel it began on March 26, for there it already was March 26 at sunset. The dates in Table I were listed according to the modern convention, not the dates in the Hebrew reckoning. With these caveats, we can say that all 37 of these lunar eclipses coincided with Passover or Sukkot. This is about one-sixth (37/230) of the twentieth-century lunar eclipses, which is what we would expect because Passover and Sukkot happen in two of the 12 months. The relatively high frequency is a result of definition of the fifteenth day of the month on a lunar calendar. Therefore, again, the coincidence of lunar eclipses with these two observances is more common than Biltz realizes. From what vantage point must one view these eclipses? There also is a question of from what portion of the earth one ought to view these eclipses for them to constitute a sign. One might think that Jerusalem would be a key site, but the first three total lunar eclipses in 2014–2015 won’t be visible from there, and only the beginning of the final eclipse will be. One must ask whether a sign that few people notice is much of a sign. What about the two solar eclipses in 2015? Biltz claims that the two solar eclipses in 2015 may be a fulfillment of the prophecy of the darkening of the sun. In one of the videos Biltz states that the first eclipse (March 20, 2015) is on the first day of the ceremonial year, attaching great significance to this fact. While this is technically incorrect since the eclipse is on the last day of the previous month and year, this discrepancy can be explained similarly as discussed above for lunar eclipses. As with the coincidence of lunar eclipses with Passover and Sukkot, the coincidence of solar eclipses with the beginning of the Hebrew ceremonial year is more common than Biltz realizes since both must happen at new moon. The ceremonial year begins close to the vernal equinox, so when a solar eclipse occurs near the vernal equinox, the solar eclipse must fall on or within a day of the first day of the ceremonial year. Table II lists the 19 of the 228 solar eclipses in the twentieth century that match the beginning of the Hebrew ceremonial year. Some of the caveats on the dates previously discussed apply here as well. The ratio of 19 to 228 is exactly one-twelfth, which is what we would expect since by definition any solar eclipse near the vernal equinox must coincide with the Hebrew ceremonial New Year. Who will witness the two solar eclipses in 2015? The first eclipse (March 20, 2015) is total. Having personally experienced one total solar eclipse, I can testify that a total solar eclipse is stunning and awe-inspiring. Therefore a total solar eclipse could be interpreted as a great sign to those who witness it. But how many people will witness this particular eclipse? The eclipse path is in the North Atlantic and Arctic Oceans. The only landfalls that the eclipse path will make are the Faroe Islands and Svalbard. The population of the former is 50,000 and the latter less than 3,000. The eclipse is of short duration, and the weather can be overcast much of the time at that latitude. There is a good chance that few people, if any, will actually see this eclipse. The second solar eclipse (September 13, 2015) is partial and falls on Rosh Hashanah. Though many people have experienced a partial solar eclipse, most of them had no idea that anything was going on. This is because unless a partial eclipse is very close to being total, the sun is not appreciably dimmed. Not actually witnessing these events but instead just knowing that somewhere some sort of solar eclipses are happening seems to fall far short of being specific and spectacular signs of end times. What Is So Important About the Second Coming? I.e., April 15, 1995; October 8, 1995; April 4, 1996; and September 27, 1996. While we can precisely define the instant of full moon today, observationally the moon appears full for two to three days. There is some suggestion that the Metonic cycle was adopted during the Babylonian captivity at the earliest. The Mythology of Saturn --- What the Truth? Oct 11, 2012 ... An annular solar eclipse on May 20-21, 2012 · A partial lunar eclipse on June 4, 2012 · A penumbral lunar eclipse on November 28, 2012. Dec 27, 2010 ... First Winter Solstice With Lunar Eclipse In 456 Years. Posted on: ... The first was a partial lunar eclipse that took place on June 26, 2010. PARTIAL LUNAR ECLIPSE: On Dec. 31st, the Moon will dip into Earth's shadow for a partial lunar eclipse. The event is visible from Europe, Africa and Asia. OBJECTS and Implications of the Shoemaker-Levy 9 Comet Crash ... Comet Hale-Bopp /Lunar eclipse during 5 deg. Moon / Mars conjunction. Heaven's Gate . As an interesting coincidence, Bush's solar return this year falls on July 5, the day of thelunar eclipse. The Moon is in Capricorn for this lunar eclipse, . Mar 6, 2012... the solar system, the light of the moon is reflected light; the shade of the Earth causes the lunar eclipse, and the orbits of the various planets. All this started for her back in 1982, during a lunar eclipse, when she felt energy pouring into her. I wish I could tell you more, because there is MUCH more.